Welcome to the Pro Football Hall of Fame, located in Canton, OH! While on our Northeastern Ohio excursion, our group thought it would be fun to explore the Pro Football Hall of Fame in Canton, Ohio. Although we’re all originally from the area, some of us had never been to the Pro Football HOF, and others hadn’t been there in years. So we all jumped in our cars and headed over to learn a bit about the history of football! 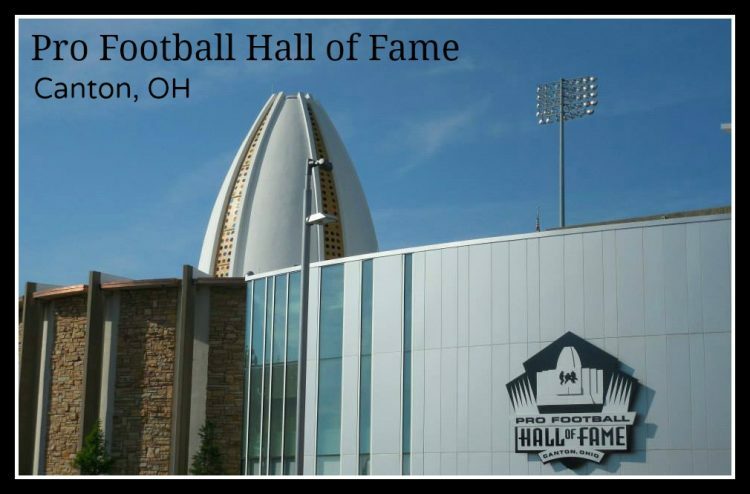 Many people want to know why the Pro Football Hall of Fame is in Canton, Ohio of all places. As it turns out, Canton, Ohio is where the American Professional Football Association (later renamed to the National Football League) was originally founded in September 1920! The location is also perfect because the Canton Bulldogs were a pretty important team, pre-NFL. 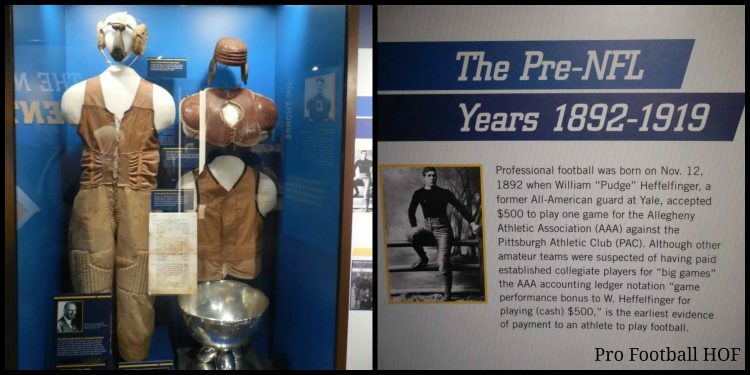 These two facts are only a few of the ones we learned while on our tour of the Pro Football HOF. So whether you’re truly interested in the sport or just want to learn a lot of facts to impress your friends, the HOF offers a lot of interesting information for tourists! Some of the jerseys that are on display in the museum. It’s so cool to see how they have evolved over time! Along with learning facts, we saw a lot of interesting football memorabilia while we were at the Pro Football Hall of Fame. 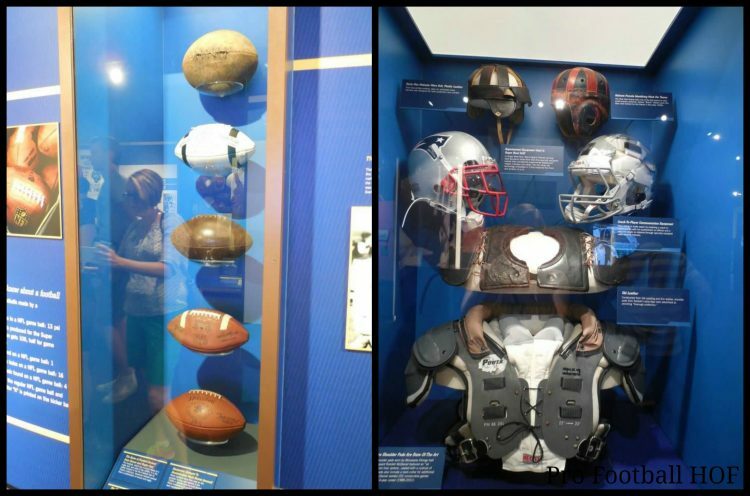 We got to see how football developed through the years, from the jerseys to the helmets to the balls to the rules. There are features that allow you to compare your body and build to some of the football players’ bodies and builds, and we had a ton of fun with those! There’s even an interactive feature that allows you to play referee! How football has evolved. It’s great seeing all of the old football memorabilia! There’s a ton to do at the Pro Football Hall of Fame, and their website recommends that you plan to be there for at least two hours. There was so much to see and do, from the football timeline to the bust room to the Superbowl rings and the Lombardi trophy, you won’t even realize how much time is going by. Shiny! 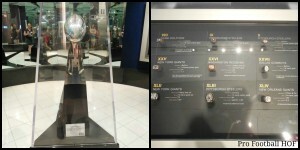 The Vince Lombardi Trophy that will be awarded to the Superbowl champs, and the Superbowl rings. Our group was lucky enough to be visiting the Pro Football Hall of Fame on Hall of Famer Friday. 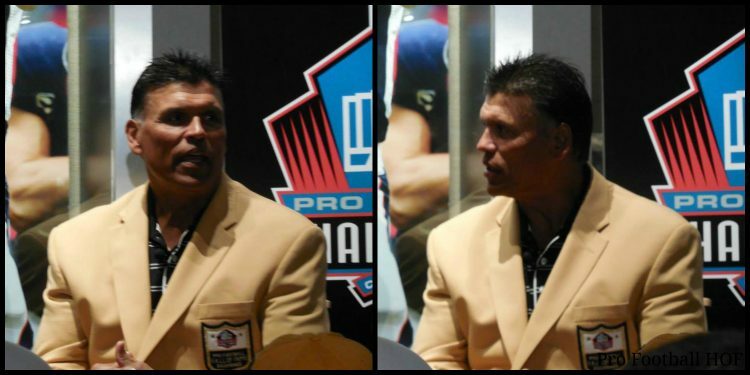 We got to listen to a Q&A with Anthony Munoz, an offensive tackle for the Cincinnati Bengals who was inducted into the Hall of Fame in 1998. It was a humbling experience to hear him talk about his career and his personal life. If you ever get the chance to visit the Pro Football HOF, I would highly recommend that you try to visit on a Hall of Famer Friday. Guests even got the chance to meet with Munoz for a few minutes after the Q&A (but no autographs allowed). 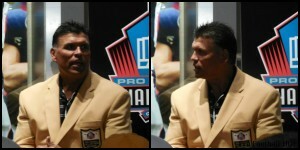 Q&A with Anthony Munoz. It was such a great experience getting to hear him talk! 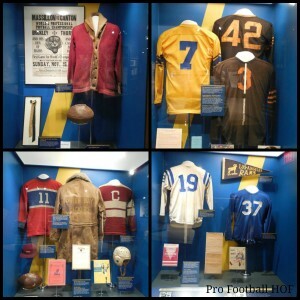 I am a huge football fan, so I thoroughly enjoyed my trip to the Pro Football Hall of Fame! I enjoyed reading about the history and evolution of football and all the memorabilia. My favorite exhibit (friends almost had to drag me away), was the instant replay booth. I enjoyed trying to make the call using the same instant replay technology that officials use. And I got the right call, 3 times out of 4! The Pro Football Hall of Fame offers more interactive features than I expected. Beyond football, kids can learn history at the museum. I liked how the second floor displays included information on what was happening in the world during that era of football. While the museum is stroller friendly, I would not bring young kids to the Pro Football Hall of Fame. There’s not a lot of space to run and play and young children are likely to get bored. If the family is on vacation and there’s a young one along, consider taking them to the outdoor football area to run and toss footballs or to the lower level to take a break and run around. It helps that kids under 6 get free admission. Overall, I highly recommend this museum for families who love football. Those who like football will enjoy it too. The interactive features and creative displays make the museum more than a football shrine. Definitely worth a look. I would not recommend this museum to families with young children. 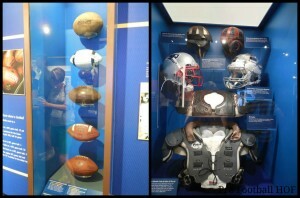 On our visit to the Pro Football Hall of Fame, there were lots of kids there — boys and girls, mostly ages 8+. I talked with a few of them to find out what they thought. Here is their advice, in their own words. Ben, 14, from Ohio. “I’ve been here lots of times. I just like the whole museum.” When asked what he would recommend to first time visitors, Ben replied, “Know which Hall of Famers you want to find and look for their memorabilia throughout the museum, not just in the Hall of Busts.” Good advice, Ben! If you plan to visit the Pro Football Hall of Fame during the summer, the museum is open 9 am to 8 pm (Memorial Day Weekend – Labor Day). If you’d rather visit during the Fall/Winter, the hours are 9 am to 5 pm (and they’re closed on Christmas). The admission rates are $23 for adults (13-61), $19 for seniors (62+), $16 for children (6-12), and free for any child under the age of 6. You can request visitors’ info, get directions, and find any other info for planning your trip by visiting here. This is a place my son would go with no fight. Thanks for the advice on what day to visit. I also love how you asked the kids and they get to see their response on here. It le’s us know what kids their age like about the museum. Thanks for sharing! I’m glad I could be of help! Let me know if you visit and if you enjoy your time! I have never thought about visiting any place like this before. It does look like there is a lot of great information and I love the fact that there are interactive activities. It sounds like a fantastic place to take the family. It’s definitely a place for football lovers, but I think there’s enough to entertain just about anyone. The interactive features were a ton of fun! I would love to visit the Pro Football Hall Of Fame, it looks like you had a great time. I love the history aspect of it….seeing how the teams came to be and how things were so different! I would go back again. I’d love to take my dad. The huge display that showed all the teams since the beginning of professional football was really amazing! Who knew the Cleveland Indians were originally a football team? Well, I’m sure somebody did — but I wasn’t among them. Very neat! 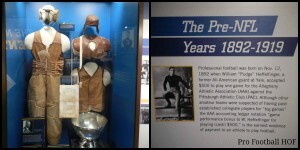 I also liked seeing the old uniforms, footballs, and “helmets.” Good thing they didn’t train quite so hard way back then. Could you see 300 lb. linemen with those things? They’d never survive a hit! I happen to love football… and the spa! I’d need to figure out a way to do both!